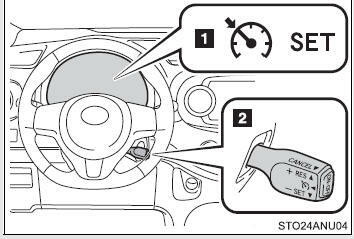 Accelerate or decelerate the vehicle to the desired speed, and push the lever down to set the speed. “SET” indicator will come on. The vehicle speed at the moment the lever is released becomes the set speed. 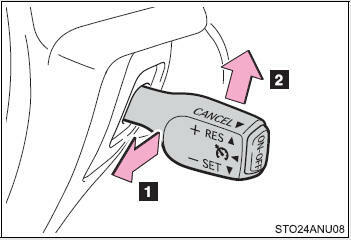 Fine adjustment: Momentarily move the lever in the desired direction. Large adjustment: Hold the lever in the desired direction. Fine adjustment: By approximately 1 mph (1.6 km/h) each time the lever is operated. Large adjustment: The set speed can be increased or decreased continually until the lever is released. ●Vehicle speed is above approximately 25 mph (40 km/h). ●Actual vehicle speed is below approximately 25 mph (40 km/h). ●VSC is activated. Press the “ON-OFF” button once to deactivate the system, and then press the button again to reactivate the system. 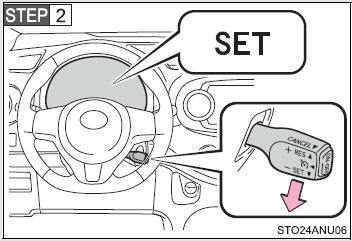 If the cruise control speed cannot be set or if the cruise control cancels immediately after being activated, there may be a malfunction in the cruise control system. Have the vehicle inspected by your Toyota dealer. 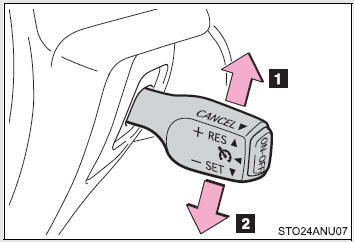 Switch the cruise control off using the “ON-OFF” button when not in use. 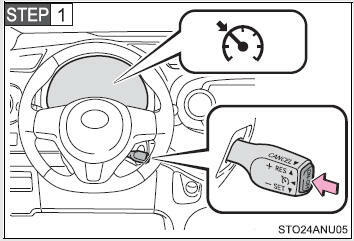 Do not use cruise control in any of the following situations. Doing so may result in loss of control and could cause an accident resulting in death or serious injury.